“I lovingly call my daughter, PIQE’s daughter; I say it in gratitude of PIQE. I was able to guide my daughter into the pathway to the University. I wholeheartedly put into practice all the knowledge I had gained through PIQE’s workshops. In this new found knowledge, while Lucia was taking classes in high school, she was also taking classes at the community college in order to meet with the credits and requirements needed. Lucia also took summer courses at two CSUs so she could meet her English requirement needed. 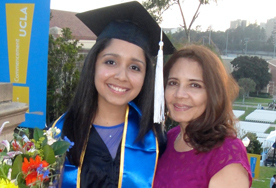 Although she met the requirements to apply to a university, we chose the alternative pathway by having Lucia attend community college for two years where she achieved an excellent GPA and transferred as a junior to UCLA, where in the summer of 2013, she received her Bachelor’s in Psychology.